Book a B&B is part of a worldwide B&B Booking Service that includes an increasing number of Directories, Portals, Regional and National websites. Who can use this service? ANY B&B, Inn or Guesthouse in any country may use the booking service offered by this website. Basic computer skills are required as we provide free online dashboard to help you maintain your online presence, manage your bookings, respond to guests, update your room rates and post last minute deals and special offers. 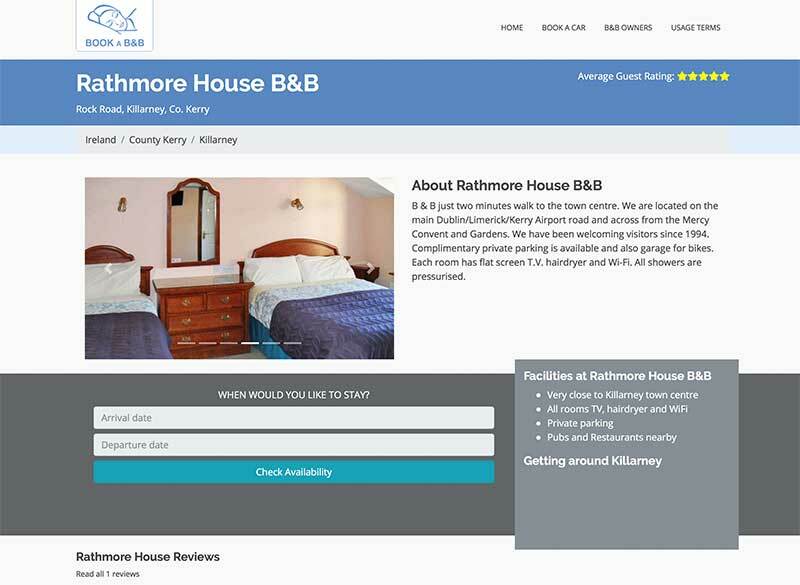 Display Page: Each B&B has a page showing a photo, description and room rates that can be amended or added to at any time. Last Minute Deals and Special Offers can be added instantly via a secure online dashboard. We also promote your last minute accommodation. The B&B display page has a number of innovations that allow you to display special offers & last minute deals. Availability is show for each room you enter and 3rd party bookings can be added with one click to keep your true availability up to date. The booking engine authorises credit card information by charging a small booking fee and then sends the full details of the booking to the B&B for processing directly. You can select payment to be cash, credit card or collect payment with one click if you have a STRIPE account. 15 Good Reasons for using "Book a B&B"
B&B Owners News: Our newsletter keeps everyone up to date with changes, new features, security issues and technology updates. Comments can be left on each article allowing members to praise or criticise. CLICK the "B&B News" icon left to read our latest news. The Online Dashboard is secure and password protected. It contains a number of useful tools for managing your online presence. Free Bookings Management Software is provided in the dashboard. All bookings can be sorted by their status, those arriving or those departing today. Clicking on any booking brings up a box with full details and the option to confirm or decline with one click using prepared emails. These emails can be amended to suit your own style. The booking engine code is available for your own website at NO additional cost, allowing you to manage all your bookings using the same dashboard. Room Description & Room Rates: Write a short description and determine a default or base rate for your rooms. These are shown on your webpage and are automatically substituted if you set up rates for specific periods, seasons, holidays or local events. Cancellation Policy: Once you have written your cancellation policy it is automatically attached to the bottom of your booking confirmation emails and the guests online booking status page. Availability Calendar: This is so simple to use - just select the date(s) that you are full or closed and this shows up on the calendar when a guest is selecting their arrival / departure dated. No-one can booked the dates that are blocked off. Statistics: Check the number and value of bookings and vistor levels for each month and year. In addition to a webpage, each B&B also has an dashboard to change rates, manage bookings and monitor performance.